Paul believes innovation and creativity are the secrets to tomorrow's business success. It seems we have forgotten how to think creatively and employees have become bored, and frustrated with their jobs. Paul believes and has proven that tapping into our creative side, our creative-brains, can transform teams and build an innovative, thriving, and collaborative corporate culture. How does he know? Paul saw it first hand when we helped transform several design firms and creative agencies into powerful workplaces. Lack of innovation and creativity cost your business money every day! It costs your business time and money in lost productivity and mediocre solutions. From Paul’s 20+ years of leading teams in the creative world, he has cracked the code of being creative. He has developed simple to understand exercises and implementable processes that help organizations turn disengaged and bored team member into creative rock-stars. Those rock-stars now help their organizations innovate towards a better future. 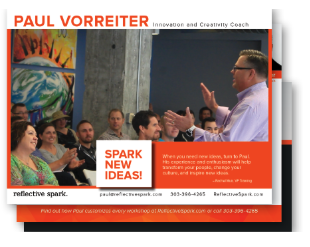 As a former creative director, Paul Vorreiter has spent many years developing exercises to ignite team members, design and build million-dollar brands, and transform workplaces. Believe it or not, creative agencies struggle with creativity too. When Paul works with your organization he helps your people relearn how to be creative, refocus their thinking and encourages them to use their creative side and develop innovative solutions for your customers. Paul's keynotes and workshops deliver strategic ways to transform your thinking and build a creative culture and inspire your team. Everyone can learn what it takes to leverage our most valuable asset, creative thinking. 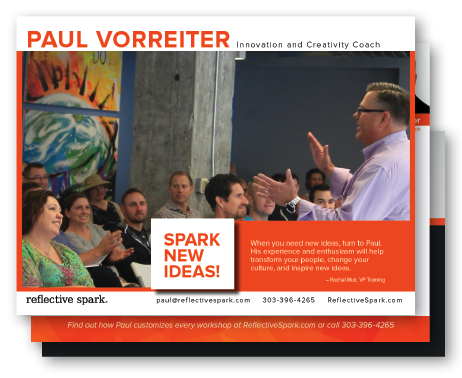 Paul knows how to help people develop stronger creative ideas and innovative thinking in simple easy-to-use skills. Whether Paul is speaking to a large conference audience or workshops for Fortune 200 business teams, he believes the secrets to innovation can be easily learned used by anyone. When your people hang out with Paul they start to learn his strategic way of thinking. They will walk away knowing how to unleash their own creativity and use Paul’s innovation secrets in your business. Participants learn Paul's techniques through the most powerful learning style there is, before and after slides for each of his secret techniques. Participants will be up and out of their seats building engaging stories using the magic of sticky notes. As a creativity expert, Paul's interactive workshop is structured for high-impact learning based on real brain science. Many participants say they didn't even realize it was time for break they were having so much fun. In short, this workshop is extremely sticky. Many of Paul's clients are repeat customers. In fact, some organizations have sent over 75 of their team members through The Presentation Workshop. Time and again, Paul's workshops receives A+ ratings from both participant and event organizers. My mind is blown! The way Paul teaches creativity is easy to understand. I can’t wait to apply his secrets with my team.